Beginning immediately after Israel’s victory in the Six Day War of 1967, settler groups began constructing illegal outposts in the occupied Palestinian territories (oPt) of East Jerusalem, West Bank, and Gaza. Many of these outposts have grown into the settlements of today. 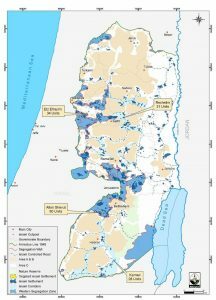 While all attempts to change the demography of occupied territories is illegal under international law, settlements receive Israeli state resources and have recognized municipal governments. Outposts, on the other hand, are established by private individuals without Israeli government approval. Though Israel withdrew 8,000 settlers from Gaza in 2005, the settler population has doubled since 1993. As of 2015, 386,000 settlers are living in the West Bank and 208,000 are living in East Jerusalem. It has been the historic policy of every U.S. administration since 1967 to oppose the existence of settlements and their expansion. Affirming the position taken by the United Nations Human Rights Council, CMEP considers both state-approved settlements and renegade outposts to be illegal under international law in violation of the Fourth Geneva Convention and maintains that their existence and continued expansion impede efforts to establish a comprehensive peace agreement between the state of Israel and the Palestinians (see CMEP Policy Position 4). After 1967, Israel established settlements in lands captured from Egypt, including the Gaza Strip. These settlements remained in place until 2005 when the government of Israel announced a unilateral withdrawal of its settlers and military from the Gaza Strip. They dismantled 21 settlements and relocated 8,000 people back to Israel. While Palestinians in Gaza no longer face the challenge of expanding settlements, the economic impacts of the Israeli blockade and infrastructure damaged during the 2008/2009, 2012, and 2014 wars has created a humanitarian crisis. Population growth within both Israeli settlements and Palestinian villages exacerbates tensions over the allocation of land and resources in the West Bank. Palestinian villages located in Area C of the West Bank (the areas of the West Bank that are still under full Israeli administrative and security control according to the Oslo Peace Accords) must apply to Israeli authorities for building permits. About 60 percent of all West Bank land falls under this category. Within the last decade, only 1.5 percent of these applications were approved. Consequently, almost all Palestinian new construction occurs without the required permits. Structures built without permits can be demolished by the Israeli military. The construction of the Separation Barrier and the restrictions on movement that it creates, prevents Palestinians in the West Bank from maintaining their land on the Israeli-controlled side of the wall. After laying uncultivated for three years, these lands can become Israeli state land under the Absentee Property Law of 1950. The government of Israel officially annexed East Jerusalem in 1980, a little of over a decade after the municipal governments merged in 1967. Since 1967, Israelis have established a dozen major settlements (referred to as ‘neighborhoods’ by Israeli media) within the portion of Jerusalem falling east of the 1948 Green Line. Zoning maps of East Jerusalem designate 40 percent of the city as green space, limiting the ability of Palestinian neighborhoods to expand. Today, Palestinians in East Jerusalem, who make up 60 percent of the city’s population, live in neighborhoods accounting for only 13 percent of land. The housing density in these neighborhoods is almost double that of Israeli areas. An estimated one in three Palestinian homes in East Jerusalem are built without a legal permit placing 90,000 people at risk of displacement. Located southwest of Bethlehem, the village of Wadi Foquin was reestablished in 1972 after being deserted for 18 years. During the first Arab-Israeli War of 1948, Israeli soldiers ordered the evacuation of Palestinians from Wadi Foquin. The village was completely demolished in 1954 and remained vacant until Israel permitted the displaced villagers to return in 1972. Since then, the growing Israeli settlement of Betar Illit has competed with Wadi Foquin for resources. Cut off by checkpoints and settler-only roads, Wadi Foquin’s land has steadily shrunk since 1987. It is estimated that since 1948 the village has lost 75 percent of its farmland. Untreated wastewater from the nearby settlement discharges directly into the villagers’ farmland, creating a public health and environmental nightmare. 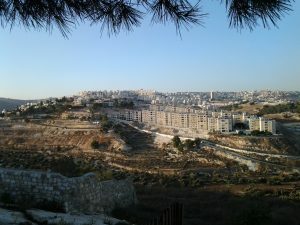 Currently Betar Illit is home to 50,000 Israeli settlers, and development plans indicate that the settlement is anticipated to grow to 100,000 by 2020. This expansion would further reduce the land available for development in Wadi Foquin. Susya was a quiet, out-of-the-way Palestinian village of 350 residents in the South Hebron hills prior to the discovery of a historic Jewish synagogue nearby. Since 1983 the archaeological site has drawn Israeli settlers who wished to be near this historic place of worship. To accommodate the expansion of this settlement, the Ministry of Defense has demolished Susya three times. After each demolition the villagers have requested permits to rebuild their community, but they have always been denied. Not wanting to abandon their homes, the residents of Susya have rebuilt their community anyway. But the village lacks basic utilities and access to healthcare and education. Once again in 2016, the Israeli Ministry of Defense issued demolition orders for Susya. International intervention stalled the process, beginning a prolonged legal battle which continues to this day. Members of the United States Congress have taken an active role, asking the State Department to intervene in order to halt the impending demolition. Between July and December of 2017, eleven members of congress and ten senators sent a total of five letters of petition to the State Department and government of Israel. In November 2017, the Israeli High Court issued its final ruling against Susya. The demolition of seven of the village’s twenty structures began on February 1, 2018. The future of the remainder of the village is uncertain. The fertile Cremisan Valley lies between the Palestinian village of Beit Jala and the Israeli settlement of Har Gilo near Bethlehem. Since 2006, the Israel Defense Force (IDF) has been planning on extending the Separation Barrier across the valley. If completed, this barrier would cut off 58 Palestinian families in Beit Jala from 850 acres of farmland in the valley, as well as preventing the children of Beit Jala from attending school at the nearby Catholic monastery and convent. While the Israeli High Court overruled the IDF’s building plans in April 2015, they reversed their decision later that year in August, allowing construction to go ahead.